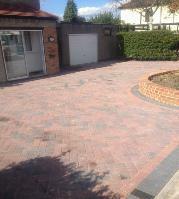 Blockpaving & Driveways in Dartford, DA1 5FS. Covering London, Kent and Essex. Welcome to Right Time Paving Limited we design and install all types of Driveways and Patios from start to finish - our team with years of experience handle project from large to small, residential and commercial. We are based in Dartford and cover throughout London, Kent and Essex. We work closely with our customers in order to guarantee complete satisfaction and peace of mind, with our expertise ensuring that each project is properly organised and efficiently completed to the highest possible standard. "The work was perfect i have recommended my friends. i'm also having them back to my back garden."